Bothen Hill: what's new this week? Sweetcorn! The recent rain has freshened all of our glorious summer veg – we love this time of year as there is just so much to choose from! Some of our favourite vegetables that we have growing on the farm at the moment are our shallots, which are bigger and better than ever before, and tomatoes. We have a range of varieties; Sun Gold, a sweet orange cherry type, which have proved particularly popular in salads, whereas the beef steak tomato varieties are excellent for cooking. Last night we had ratatouille with our own shallots, tomatoes, courgettes and garlic. Delicious! 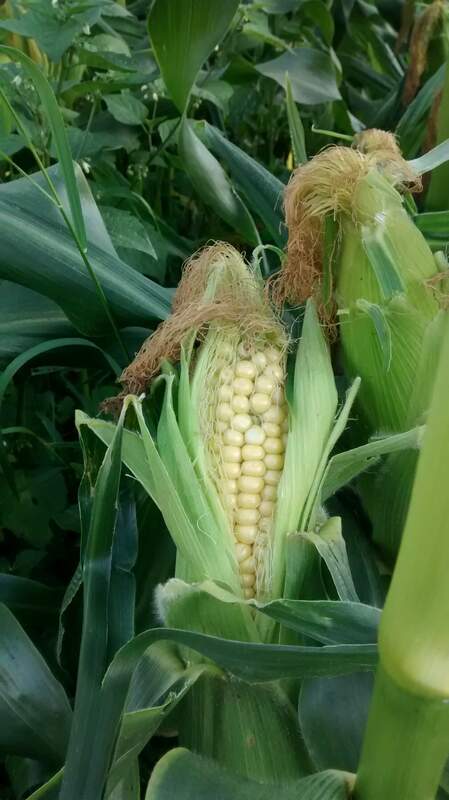 In addition to the veg we’ve had coming through all summer, yesterday we also picked the first sweetcorn of the year. At the moment we’re picking our Early Bird variety, which will be followed by the others which we hope will crop for another month. Our favourite way to enjoy this sweet vegetable is boiled and served with a bit of butter – traditional corn on the cob. We also quite like it barbecued if the weather’s good. Our absolute all-time favourite recipe is here – Jamie Oliver gives it a great Mexican twist. Enjoy!